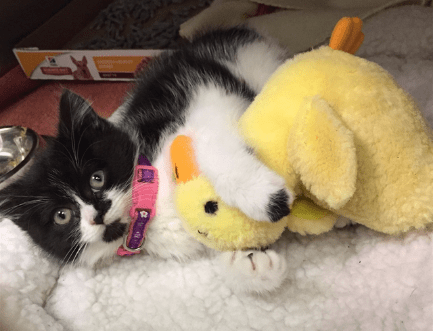 At just 2 months old, a black and white kitten named Talleyrand was in a life-or-death situation: the young, abandoned feline had fallen down a storm drain. Even more distressing, she was paralyzed and had no movement in her hind legs or tail. 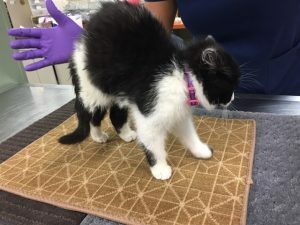 The kitten was brought to the Humane Rescue Alliance in Washington, D.C., with injuries that were left untreated for several days, according to the organization’s blog. “X-rays confirmed she had a fracture of her L3 vertebra and shifting of her spinal column,” the post stated. Because of her paralysis, Talley had no control of her bladder, either. She is currently up for adoption to a loving forever family who is willing to take care of her and her unique set of circumstances. “Talley continues to recover each day and each week,” Townsend said.